Quicktate transcribes voicemail messages, memos, letters, legal files, medical files, recordings of phone calls, conference calls and other audio files. Submit audio files using the Quicktate iOS app, voice recorder, email, or API, and then receive the completed transcription back online, by email, in Evernote, or via API. 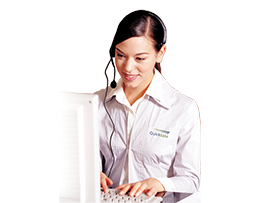 Quicktate audits, summarizes, evaluates and analyzes audio recordings and phone conversations so companies can be sure they are providing the highest level of support to their customers in a timely and responsive manner. Integrate with Quicktate using our flexible API for voicemail and audio transcription, call auditing and analysis, and much more. Our backend is used by hundreds of innovative customers and their millions of end users. Speech is the cornerstone of human communication. It's the most natural way we interact - so why aren't you using it to your advantage?